When being charged with organizing the genocide of six million Jews, Adolf Eichmann faced survivors from inside a bullet-proof box. 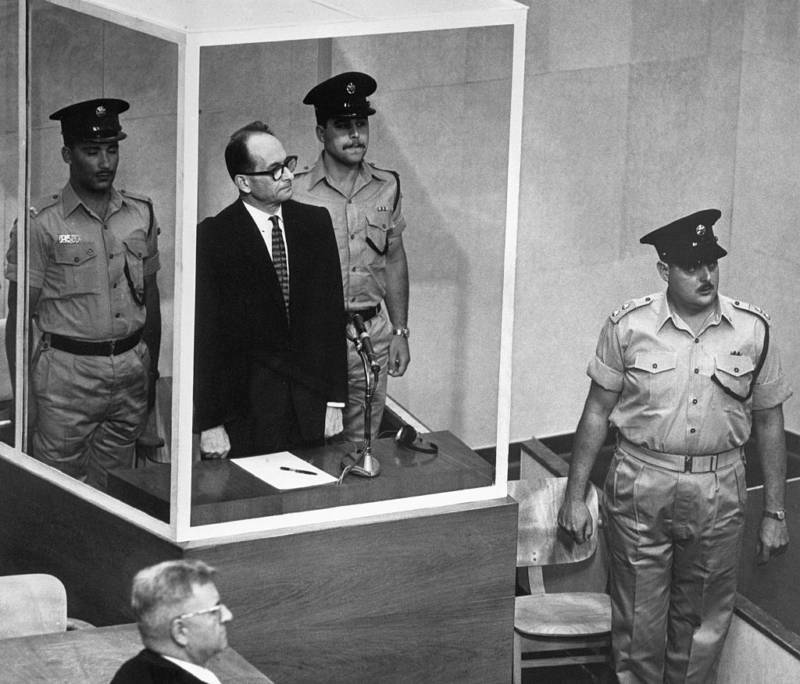 Public Domain5/29/1962-Jerusalem, Israel- Adolf Eichmann, accused Nazi mass murderer, stands in his bullet-proof glass cage to hear Israel’s Supreme Court unanimously reject an appeal against his death sentence. In the foreground is defense attorney Robert Servatius. Adolf Eichman was one of the most prominent engineers of the Holocaust. As the genocide’s chief logistician and “Director of Jewish Affairs” he was responsible for planning the deportation of hundreds of thousands of Jews — first to ghettos and then to concentration camps. During his time as a Gestapo leader, he took part in conversations on how to annihilate Jews and paid regular visits to the extermination camps. And now you can see his trial, courtesy of New York’s Museum of Jewish Heritage. After the end of the war, Eichmann managed to escape U.S. custody. With the help of the Catholic Church, he fled to Argentina, where he lived for 14 years. The proceedings — during which many Holocaust survivors testified — captivated the world, as many learned the true horrors of the Nazi regime for the first time. Though 22 major Nazis had been convicted in the famous Nuremberg trials more than a decade earlier, the military style was more focused on documents and somehow less emotional, Lipstadt said. For one, there was the dramatic nature of only having one man’s fate on the line. Plus, people had had years to process the horrors of what had happened. 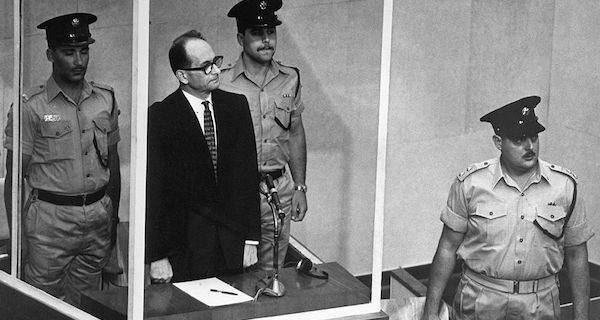 The trial was also startling to viewers because Eichmann — 15 years removed from the war — seemed so bizarrely normal. In a glass box surrounded by 700 spectators and faced with people he had once had carted away to presumed death, Eichmann looked like your run of the mill nerd. “People were amazed because he looked much more like a bureaucrat, like a pencil pusher, [with] thick black glasses, an ill-fitting suit, a man who laid out all his papers and his pens and kept polishing his glasses with a nervous tick,” Lipstadt said. Eichmann’s first defense? The trial was not legal in the first place, and should be relocated to West Germany. This argument was quickly countered by the three presiding judges, who said they’d received United Nations approval. Next, the defense attempted to portray the 56-year-old as a helpless victim who had no choice but to follow Hitler’s orders. “I was one of the many horses pulling the wagon and couldn’t escape left or right because of the will of the driver,” Eichmann said from the stand. After 56 days in court — during which hundreds of documents were presented alongside testimony from 112 witnesses — Eichmann was convicted of crimes against humanity and the Jewish people. Eichmann was hanged at midnight on June 1, 1962. His execution remains the only time Israel has ever enacted a death sentence. 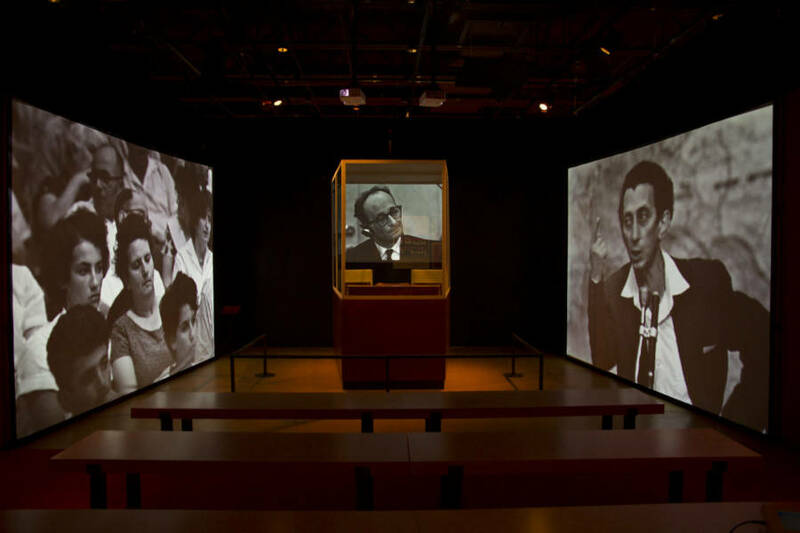 Now, justice will be served over and over again as the New York Museum of Jewish Heritage shows footage from the proceedings in a recreated court chamber. The exhibit, dubbed “Operation Finale,” will also feature recently declassified artifacts from Eichmann’s capture. Next, read about how a new commission will soon investigate the extent of a secret Nazi cult’s crimes. Then, check out the full-scale Parthenon made out of 100,000 books in the exact place Nazis once burned them.